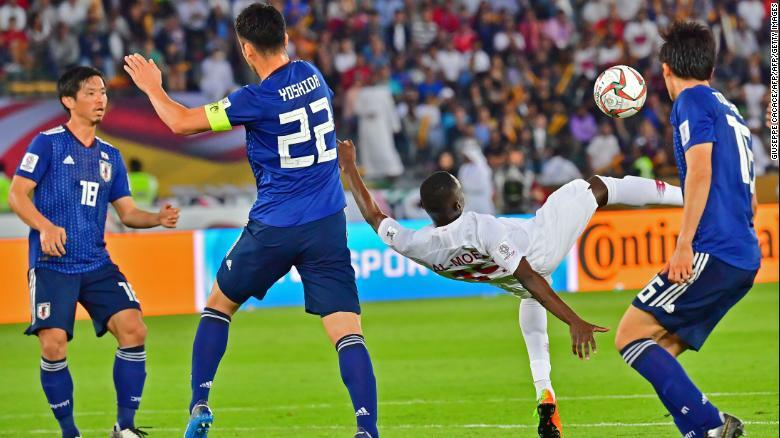 Qatar produced the most famous moment in its sporting history Friday after defeating Japan 3-1 in the final of the Asian Cup. In a tournament that has been as much about the geopolitical struggle in the region as much as the football itself, Qatar secured the sweetest of triumphs courtesy of goals from the competition’s top scorer Almoez Ali, Abdelaziz Hatim and Akram Hassan Afif. To win the title was perhaps unexpected, but to do so in the United Arab Emirates, one of the countries to join with Saudi Arabia, Bahrain and Egypt in breaking off relations with Qatar in June 2017, is likely to feel even more satisfying for those in Doha. Almoez Ali’s spectacular overhead kick gave Qatar the lead. While Qatar’s participation in the tournament was ostensibly about football, the talk throughout has often steered away from the sport and instead centered on the political and diplomatic strife in the region. Qatar’s 4-0 win over the UAE in the semifinal was particularly difficult for the host nation to swallow, but this result is likely to prove even more embarrassing with celebrations likely to last all night in Doha. The boycott of Qatar, the worst diplomatic crisis to hit the Gulf Arab states in decades, followed allegations that the state was supporting terrorism and destabilizing the region. Much of the criticism aimed at Qatar comes from its alleged support of the Muslim Brotherhood, an Islamic group considered a terrorist organization by Saudi Arabia and the UAE. 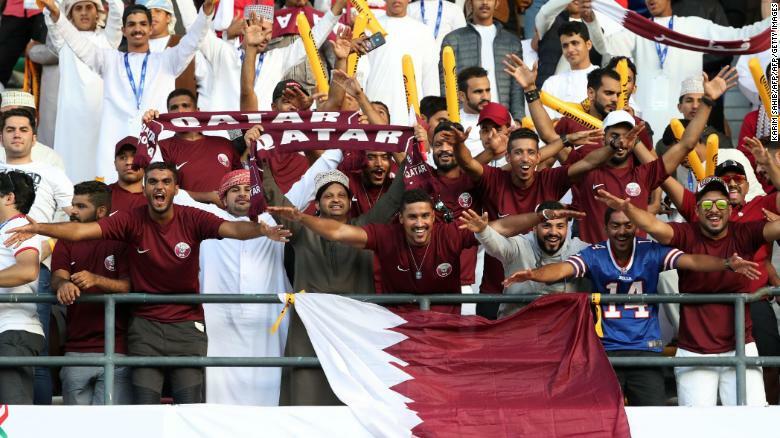 Qatar supporters cheer during the 2019 AFC Asian Cup final football match between Japan and Qatar. Qatari citizens were given 14 days to leave Saudi Arabia, Bahrain and the UAE, while all three countries banned their own citizens from entering Qatar. Yemen, Mauritius, Mauritania, the Maldives and Libya’s eastern-based government also joined the boycott. The air and land blockade imposed on Qatar also meant that the national team had to take a longer route to reach the UAE, flying via Kuwait instead. Abdelaziz Hatim of Qatar scores his team’s second goal against Japan. But the off-field tensions have not appeared to have had any negative effect on a Qatari side that was ranked 93rd in the world going into the tournament. Even when the Asian Football Confederation confirmed to CNN that the UAE football association had lodged a formal complaint with the Asian governing body over the eligibility of two of Qatar’s players, a complaint that was dismissed, Qatar seemed unfazed. Its run to the final of the competition, which included victory over the much-fancied South Korea in the quarterfinal, and UAE in the last four, was remarkable. And yet, against a Japan side, a four-time winner of the competition, it reached a whole new level. Led by Ali, whose spectacular overhead kick was his ninth goal of the tournament, a new record for the Asian Cup, Qatar doubled its lead on 27 minutes when Hatim fired home. Japan’s forward Takumi Minamino scored in the second half. 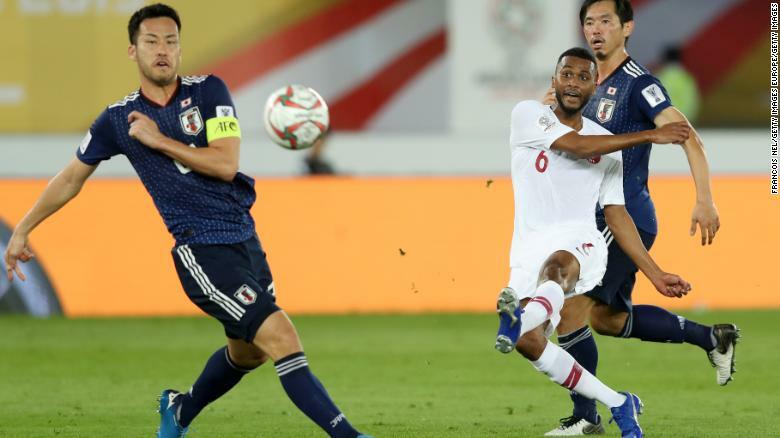 Japan fought back in the second half with Takumi Minamino halving the deficit in the 69th minute, the first goal Qatar had conceded in the tournament. But any hopes Japan had of rescuing the tie were firmly extinguished when Afif kept his cool to score from the penalty spot to settle the tie and start the celebrations. For Qatar, the host nation of the next World Cup, 2022 cannot come soon enough. Next articleVenezuela crisis: Putin’s new Cold War on America’s doorstep?